Earlier today I spent a few minutes watching a man lie face down in some kind of cell from an overhead surveillance cam. Now he’s pacing around in circles while a timer counts down. It’s just another day in the increasingly inscrutable world of game announcement announcements. This time, it’s Square Enix bringing us the saga of The Man in the Cell, and it seems likely that this is all building up to the announcement of a new Deus Ex game. All we know for sure is that this event will reveal info about a new game from one of Square Enix’s studios outside Japan. The dystopian sci-fi elements point to Deus Ex, however. The Twitch stream is called Can’t KIll Progress (again, pointing to Deus Ex given how Human Revolution ended), and it will apparently unfold across the next three days. 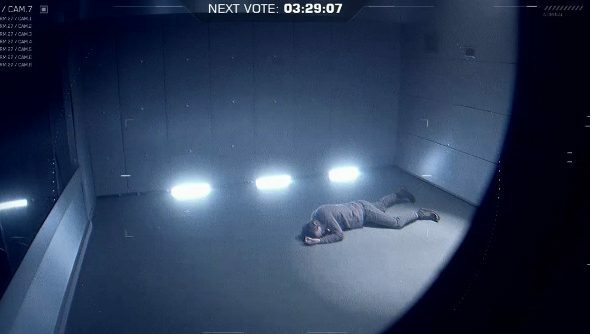 At regular intervals, some kind of vote will be held on-stream while, for the rest of the time, you can watch an actor pretend to be psychologically tortured in a cell. It’s some Tobias Funke stuff, people. All Square Enix have said about the campaign is that it is meant to be a reveal for a project from one of Square Enix’s “Western” studios, so the pretty much narrows it down to Deus Ex or Hitman. I’d be stunned if somehow this connects with Tomb Raider. Anyway, there you have it. Right now there are 12,000 people (including me) watching a man lie on a floor and occasionally beg for mercy. No matter what’s revealed later this week, I think the real dystopian nightmare has already begun. If you do want to keep tabs on this, however, Reddit seems to be doing a decent job of summarizing what’s happened without you having to watch five hours of nothing happening.